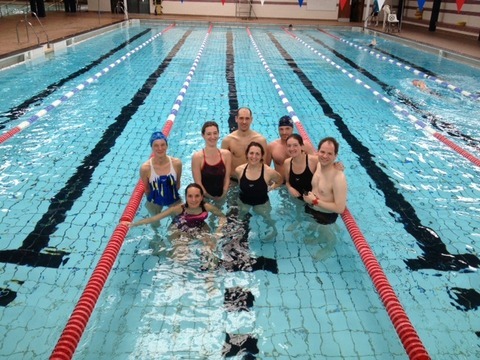 Cally Masters members Abigail Morris, Luka Crnjakovic, Jo Challands, Hilary Jones, Dylan Haughton, Jonathan Silverman, Fran Bigman and Georgina Hovanessian all competed in the 2013 Swimathon to swim 5k as fast as they could. The team did amazingly well and finished in 1hr 27mins!! Not only did they achieve a fantastic time but they also managed to raise over £500 for Marie Curie. Well done to you all! Cally Masters looks forward to taking part in this amazing event again next year. This entry was posted in Swimming Club and tagged Cally Masters, Marie Curie, Swimathon, swimming. Bookmark the permalink.